I was pleased as punch when my docrafts website gallery caught the eye of the folks at Creative magazine a while back. They asked if I'd like to do a magazine tryout and of course I said yes. 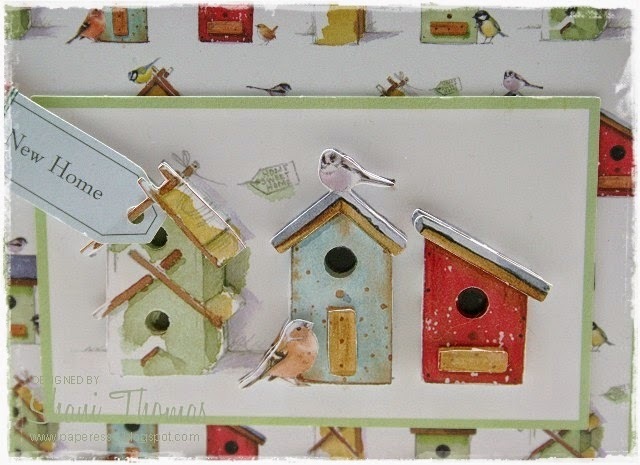 They sent me the Papermania Home To Nest A4 Ultimate Die-cut & Paper Pack (PMA169051) to craft with. I made three cards and an album. They liked my work and as I mentioned in a recent post I have a card in the August issue. I didn't want to post these trial projects without approval, but I asked and have been given the okay to do so. Since each project included written instructions and top tips, I thought I'd share those with you as well. 1. Cut a green paper square 12.2 x 12.2cms. Cut a birdhouse paper square 11.7 x 11.7cms, center on the green square and glue. 2. Adhere a band of green striped craft tape near the bottom of the square, layer a band of red spots tape over the green. Trim excess. Center paper on 5" square card blank and glue. 3. Add green and red craft tapes to the very end of the New Home sentiment tag. Punch a small hole in the end of the tag. 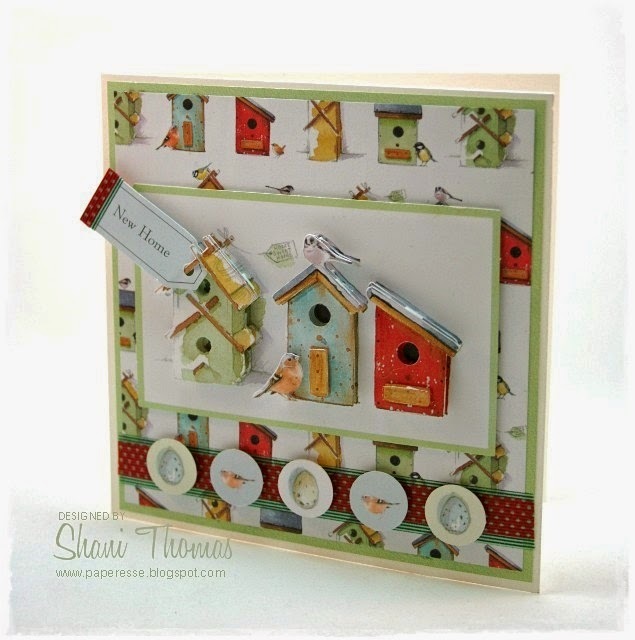 Build the decoupage birdhouse image with 3D foam squares and slip the sentiment tag onto the top layer of the left birdhouse, securing it with a little glue. Measure 3.5cms from card's bottom edge, center decoupage image on the card and glue. 4. Glue bird and egg circle die-cuts to the craft tape band with 3D foam squares. For greater 3D effect hang your tag from a piece of the layered 3D decoupage image. Craft tape is a quick, easy to adhere, alternative to ribbon. Shani ta carte est magnifique!!! J'ai un bloc de cette collection qui m'attend mais je n'ai pas trouvé l'occasion pour faire quelque chose.... De voir ta carte ça donne envie, elle inspire vraiment!! Hello there beautiful!!! I know I am sorry I have not visited in awhile but, that didn't mean I forgot about you!!! 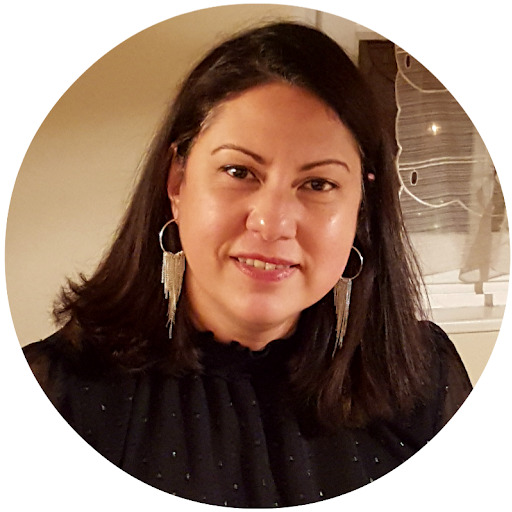 I wanted to stop by and say hello!!! I see you are still making us jealous with your amazing travels pictures!!! Oh and the food!!! OMG...if I could just scratch the screen to get a scent...AHHH!!! Well I hope you are doing well and I will I promise to make more frequent stops!! Have a great day!! Big HUGS! !